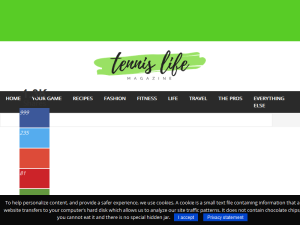 We're a lifestyle e-zine for tennis players, with great tennis tips, strategies and tactics; health and wellness tips and healthy recipes; geared toward athletes; tennis-specific workouts and fitness tips; tennis gear reviews; injury prevention articles; motivational posts and more! This what your Tennis Life Hacks Blog Ad will look like to visitors! Of course you will want to use keywords and ad targeting to get the most out of your ad campaign! So purchase an ad space today before there all gone! If you are the owner of Tennis Life Hacks, or someone who enjoys this blog why not upgrade it to a Featured Listing or Permanent Listing?